The Texas Facilities Commission is implementing miniMAX, a centralized trash/recycling program, in all TFC-managed facilities. Once the program is fully implemented this Fall, over 20,000 state employees will be participating. miniMAX entails each employee utilizing a miniature trash receptacle (mini-bin) at their deskside as well as a deskside recycling bin. In order to make employees feel responsible for the waste they produce, they are required to empty their own mini-bins and recycling bins at conveniently located central collection stations, rather than relying on custodial staff for that service. 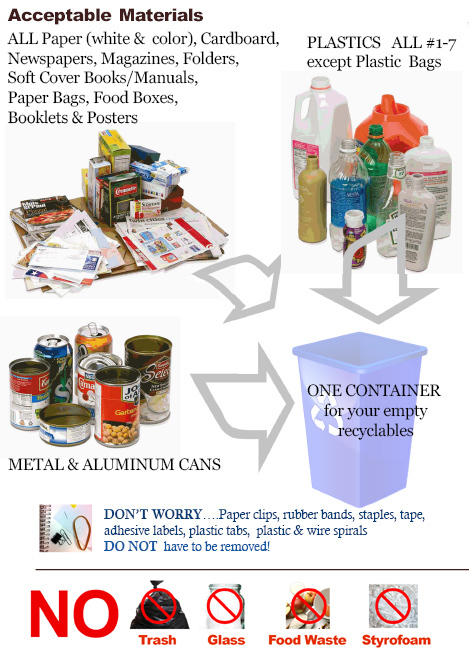 To increase recycling rates in an office environment, where the vast majority of refuse is recyclable, the small size of the mini-bin acts as a visual yield sign for employees when they discard something. miniMAX is a proven concept successfully executed in numerous government and private organizations across the country since the early 1990's. Programs have achieved up to 80% waste diversion using mini-bins, and in TFC-serviced facilities, the State will save $700,000 annually in custodial labor costs through miniMAX, greatly mitigating the cuts to other custodial services brought about by the recent state agency budget cuts. miniMAX will also produce increased recycling revenues and decreased garbage collection costs.